These scientific diagrams depict "vibrations in solid bodies," including rods and plates. This essay is included in a sampling of essays for a course book on general physics (containing a hand-written table of contents and notes on various chapters). All of the chapters appear to be reproductions rather than actual published articles. The section on sound runs from page 747 to 824 and includes 6 black and white plates. This image served as an illustration in Sir John Herschel’s essay, Treatise on Sound. In this image, Herschel presents readers with another set of experiments that helps them conceptualize the movement of sound through space, again depending on the visual. Figures 36-41 involve the vibrations of a rod either resting against a wall or free. 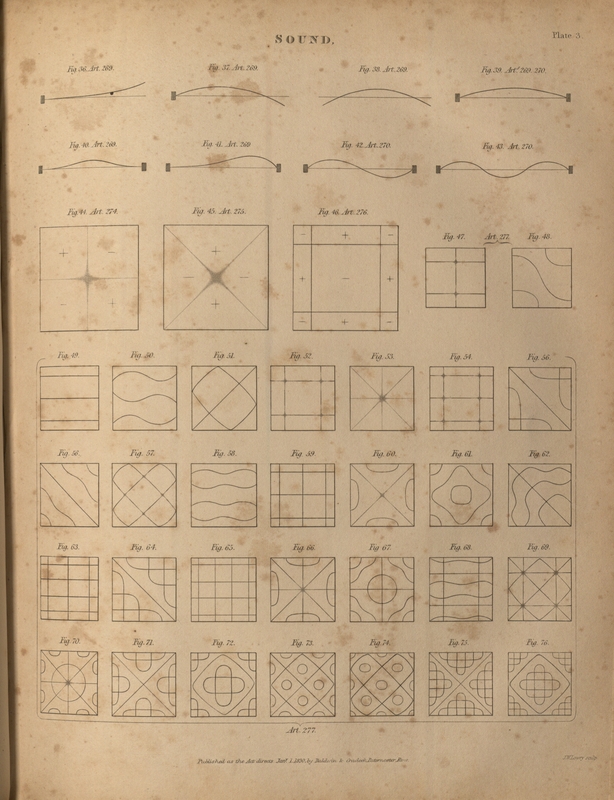 Even more interesting are figures 42-46; these illustrations depict “vibrations in plates of metal,” and show the movement of sand on a plate being vibrated with a bow. Herschel writes that the sand is “thrown away from the vibrating parts" and accumulates "on those at rest." The succeeding figures are the same experiments applied to circular, as opposed to square, sheets of metal. Sound. Acoustics. Vibrations. The senses. This image marks yet another way to conceptualize the aural through visual means. Sound becomes embodied, made visible in the varied and beautiful patterns produced by the motion of its waves through sheets of metal; if sound can be said to have a character—such as that ascribed to the Aeolian harp by Romantic poets and philosophers—then Herschel provides us with an elegant depiction of the aesthetic quality of that character. The patterns are symmetrical, balanced, and intriguing. While the primary objective of these engravings is ostensibly scientific (given the context and content of the text they accompany), they also fulfill the surreptitious function of aestheticzing sound: by making sound visible, the engravings ask the observer to reconceive the sounds that reach his or her own ears in a particular, aesthetic way. In order for the reader to understand harmonics in terms of what we hear, these writers have determined that the harmonics of what we see will provide the easiest parallel. In this case, they go on to describe the way in which one may look at a square of blue, and yet, when looking away, see a red square instead. These ghost colors are a fitting representation of musical harmony: both colors and harmonics are invisible supplements to what either the eye or ear, respectively, is actually sensing. Born out of resonance and vibration, this confluence of sight and sound buttressed an eighteenth-century and early nineteenth-century understanding of the shared, invisible aspects of sight and sound. "ART. VI.-A Treatise on Sound." The Quarterly Review 44.88 (1831): 475-512. Print. Ferguson, W.T. Sir John Herschel and Education at the Cape 1834-1840. Cape Town: Oxford UP, 1961. Print. Hankins, Thomas, and Robert Silverman. Instruments and the Imagination. Princeton: Princeton UP, 1995. Print. Barlow, Peter and John F. W. Herschel. The Encyclopaedia of Mechanical Philosophy: Comprising the Sciences of Mechanics, Hydrodynamics, Pneumatics, and Optics. London: J. J. Griffin, 1848. Print. “Joseph Wilson Lowry, F.R.G.S." Nature 20.504 (1879): 197-198. Print. Plate 3: Sound. Black and white print plate.